Created by Marmi Fontanelli in collaboration with Intermac, the work shows very well the level of the Italian businesses when industry and crafts combine their potential. Marmi Fontanelli is an artisanal stone working company located in Vezzano Sul Crostolo, in the province of Reggio Emilia. Having founded the company in 1965, Franco Fontanelli later ceded control to his son Claudio, who joined his father’s business in 1985 and succeeded in transforming it by following a very specific vision: that of acquiring advanced equipment, because only a leap forward in terms of technology would allow the company to focus upon new applications, thus attracting potential clients from various markets. Today, Marmi Fontanelli’s core business lies in the top-class construction and furnishings industries. The funerary industry only represents a small part of the company’s production, and together with other sectors contributes to the formation of a highly diverse and extremely loyal clientele. This evolution was rendered possible (and evidently not by chance) thanks to the company’s fleet of machinery, which are not inferior to those of much larger companies: “We had to expand to other markets, because the figure of the marble worker has changed over time, and today their presence can even be required in extremely diverse contexts: we needed to equip ourselves to intercept and meet these new demands”, explains Claudio Fontanelli. 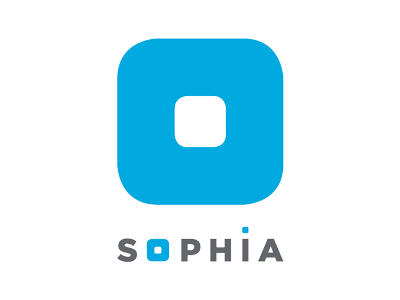 The company currently operates seven machines. 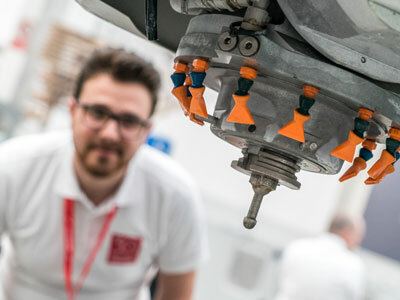 These include three Intermac models, the most recent of which is described by the proprietor as the company’s flagship: the Master 850, the latest generation five-axis work centre to be produced by the Pesaro-based company. 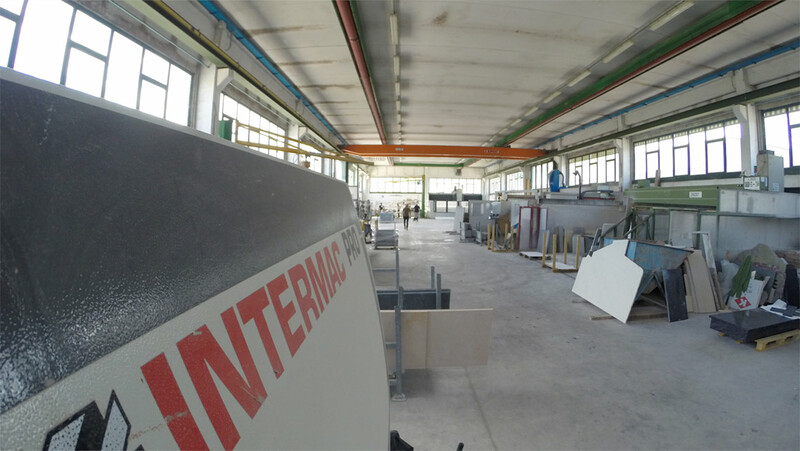 Fontanelli continued: “With our Intermac systems, we are now capable of performing any type of processing operation: we carry out projects for final users, as well as for companies operating in the furniture, architecture, construction, and distribution industries. 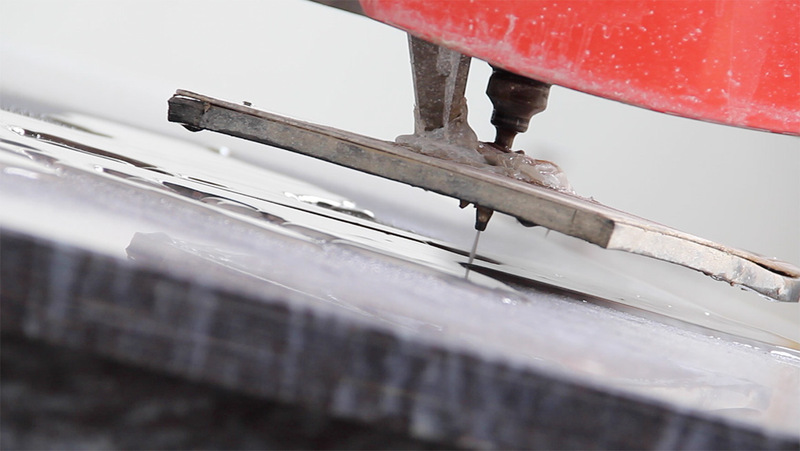 Our clients even include stone working companies that are not equipped with our technologies. 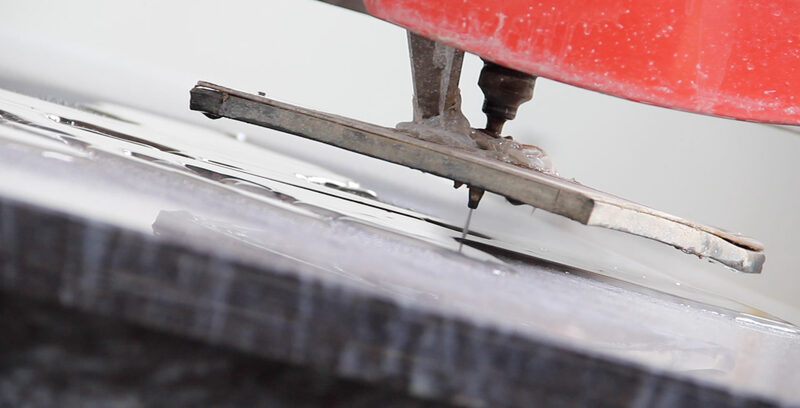 The systems in our possession provide us with good margins, because the pieces that we produce are essentially unique: washbasins, shower trays, portals, bas-reliefs, kitchen counter tops, floors, inlaid bathtubs, columns, profiled windowsills, statues, fountains... We are capable of performing any type of cut, even on ceramics, stoneware, earthenware, and agglomerates, the latter of which is often used for kitchen counter tops. With our latest acquisition, the Master 850, we have succeeded in further expanding our range of processing operations, and are now capable of handling greater thicknesses with more advanced technologies”. Together with Marmi Fontanelli, the Master 850 has taught us a lesson about the levels that Italian craftsmanship is capable of achieving: the creation of a sculpture, the Bicefalo (or Two-headed snake) in white Carrara marble, which was carried out entirely by the machining centre according to a specific programme. The work was commissioned by the studio of designer Raffaello Galiotto of Chiampo (Vicenza), who selected Intermac as his technological partner. In turn, the Marche-based company contacted Marmi Fontanelli, which formed a team made up of its technical expert, Cristiano Ravagnan, Claudio Fontanelli, and his sons Luca and Marco. The production activities began on 23 March, as soon as a marble block of a suitable size had been obtained: after 223 hours of machining (and a total of 38 km travelled by the Master 850’s tools), excluding the time employed for the manual finishing, the work was completed on 11 April. 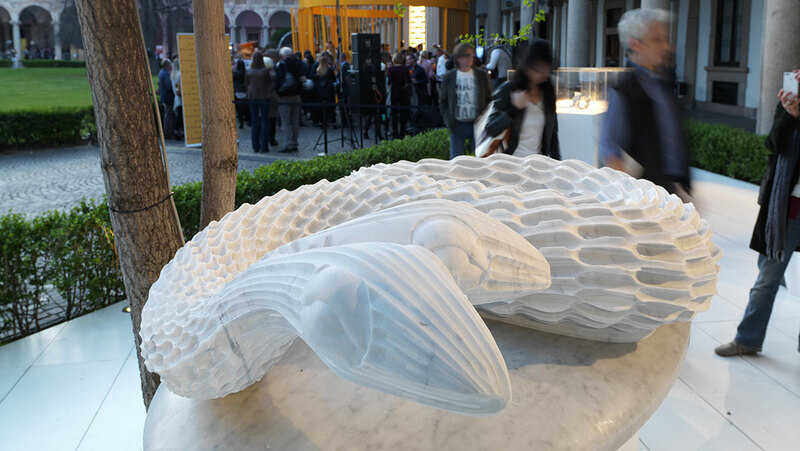 The Bicefalo statue, which is approximately two and a half meters long, was displayed just a few days later at Fuorisalone in Milan during the course of the “Digital Lithic Design” exhibition organised by Marmomacc Verona, and was later transported to Milan’s Expo 2015 fairgrounds, where it is currently on display. 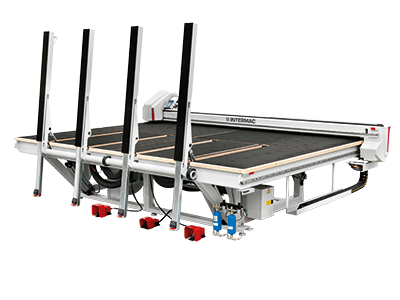 “In order to carry out this project, we pushed the Master 850 to unknown limits, with the work centre’s five axes in positions that we thought were impossible. We worked in synergy with Intermac’s technical expert, Cristiano Ravagnan, who played a decisive role in helping us set up the 54 scoring and finishing programs utilised: we had never carried out a project of this type before, and continuous consulting was therefore necessary in order to help us fully exploit this machine’s enormous potential”. Claudio Fontanelli also likes to highlight another aspect of his relationship with Intermac’s systems: “For me, focusing upon innovation means having the possibility to involve my children in the company as well: the new generations like to rely on technology, and if I had told them to pick up a grinder and a mask and to follow in their father’s footsteps, the generational change might have been at risk. What’s more, Intermac’s technology can be exploited by everyone: from my experience, I can guarantee that the machinery’s bSolid management software allows any operator, even those without any particular computer skills, to get the most out of these systems with minimal effort”. At Expo 2015 in Milan, the Bicefalo statue will be on display for millions of visitors: the pride of a mechatronics company from Pesaro, and a stone working company from Emilia Romagna.